To get your fingers up towards the twelfth fret and beyond you will have to shift your left hand up and down the fingerboard. Shifting is involved whether you are travelling one fret or ten and the technique is pretty much the same, however, there are a few things to look out for when making large shifts/leaps on the fingerboard. When I am teaching a student to shift I like to make them think that their left hand is on rails, like train going up and track. The train doesn’t shift or morph as it goes along the track and neither should your hand. The tendency might be to ‘grab’ and the note you are shifting to. In doing this your hand position will go all out of whack and you will lose strength and accuracy in your fingers. If, however, you maintain your left hand position and shift the entire forearm up the neck you will find that there is a lot more accuracy and that the connection between notes is better. When shifting up an down a guide finger can become very useful. A guide finger is a finger that maintains contact with the string but it isn’t pushing down at all. It simply acts as a point of reference for the hand so it stays secure, kind of like holding a handrail. You might not need it, but if you are climbing stairs in the dark, you sure are glad its there. More often than not, the first finger will act as the guide finger, especially if you are playing on one string. 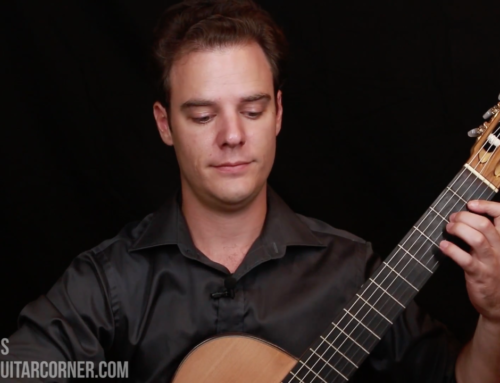 Chromatic scales are good practice fodder for guide fingers (or exercises in the 7 Technical Routines for Beginner Classical Guitar). You can simply play the chromatic scale on the first string from the first to the twelfth fret (then back down again) using the fingers in sequential order: 1234 – 1234 -1234 and then 4321 – 4321 -4321 In between each group of four, you will need to shift the left hand and while you shift the left hand steadily along its ‘tracks’ you can lightly slide the first finger along the string to act as a guide. The fingerboard really isn’t that long when you think about it, but when it comes to a ‘big’ shift in a fast passage, it can seem like frets are miles apart. If you want to make sure you nail those shifts every time, you need to start eyeballing them. Just as you might prepare your left or right hand for some movements, you can prepare your shift by moving your line of site to the landing point of your finger before it takes off. The best way of developing this skill is by practicing slow leaps in the left hand and developing the habit of moving your eyes before you shift. Lets start with octave leaps on the first string. Place your first finger on F on the first string and play the note. Then, before your move your left hand finger, focus your eyes on the 13th fret, also an F. Now that you have locked on to the target, shift your first finger up to the 13th fret in one smooth, shallow, arc. Repeat the process in reverse to shift down. Play the high F, eyeball the first fret, then shift. octave shifts F – F, F# – F#, G – G etc. Contracting shifts F – F, F# – E, G – D# etc. Shifts up the fingerboard and across strings, alternating left hand fingers, shifting with rhythms, diads, triads, etc. the variation is up to you! With time, and patience, you will create a habit of eyeballing shifts and it will become part of your technique.